THE RESULTS OF a ‘bionic eye’ trial offer hope to patients with a rare eye disease, according to an Irish expert. Eye surgeon and President of the Irish College of Ophthalmologists, William Power, said the results of a trial of a ‘bionic eye’ “offer considerable promise to patients with end-stage retinitis pigmentosa and the potential for an improved quality of life in the majority of patients”. Power made the comments following the publication of the findings of the three-year clinical trial in the American journal Ophthalmology. The Argus II Retinal Prosthesis System consists of a small electronic device implanted in and around the eye, a tiny video camera attached to a pair of glasses, and a video processing unit that is worn or carried by the patient. Retinitis pigmentosa is a genetic, incurable eye disease that causes slow vision loss which eventually leads to blindness. It leads to a breakdown of cells in the retina — the light-sensitive tissue that lines the back of the eye. For the study, a clinical trial of 30 people, aged 28 to 77, was conducted in the United States and Europe. All of the study participants had little or no light perception in both eyes. The researchers conducted visual function tests using both a computer screen and real-world conditions, including finding and touching a door and identifying and following a line on the ground. The visual function results indicated that up to 89% of the subjects performed significantly better with the device. After one year, two-thirds of the subjects had not experienced serious adverse events. After three years, there were no device failures. Throughout the three years, 11 subjects experienced serious adverse events, most of which occurred soon after implantation and were successfully treated. One person had to have the device removed. Power said people with other sight loss conditions can take heart from the findings, as it could lead to other developments in the field. The device costs about €115,000 and more trials are planned, but none for Ireland as of yet. Jeroen Perk (36) was implanted with the device in the Netherlands in June 2013. As a child, he had some issues with his sight, but “saw very well” until he was 15 years old and was able to play sports. By the time he was 19, he had lost about 90% of his vision. Jeroen said this was very difficult to come to terms with as it happened at such a formative age and forced him to re-evaluate his life plans. “Two weeks after the surgery, I started to see light,” he recalled, saying that two years on things keep getting “better and better”. He uses a cane and a guide dog to get around, but is able to see things like “the difference between the pavement and the grass line” and the flame of a candle. He can now ski and practice archery. More information about Argus II can be found on SecondSight.com. Email “Breakthrough as 'bionic eye' restores sight in blind patients ”. 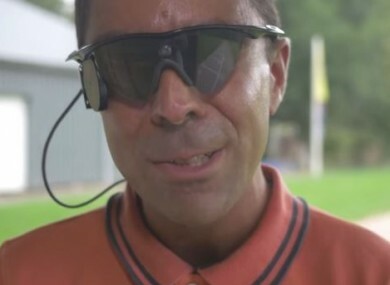 Feedback on “Breakthrough as 'bionic eye' restores sight in blind patients ”.